Different generations and cultures are drawn together by the love of music in this gentle picture book by CBC Radio documentary writer David Gutnick. 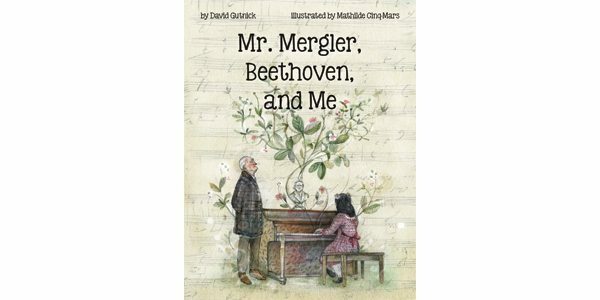 The book is based on a true story taken from the life of the late Daniel Mergler, a Montreal pianist who chose teaching over a concert career. Playing in a Montreal park one day, a young girl sees her father talking to an elderly man. The family has recently arrived from China and the girl has shown an affinity for music. The man turns out to be Mr. Mergler, a musician and piano teacher. After hearing her sing, Mr. Mergler offers to work with the little girl; in the embarrassed silence that follows, he adds that his instruction will be free of charge. As the lessons progress, the child fancies that the bust of Beethoven, looming rather forbiddingly over the piano, is frowning at her mistakes and is generally unimpressed with her ability. But as her skill increases, she imagines Beethoven acknowledging her improvement and scowling less. Gutnick’s story skilfully conveys the growing confidence of his young narrator, and her absorption in an art. The delicate illustrations of Mathilde Cinq-Mars evoke the strong-though-contained emotions of the characters and the flowering of musical talent. Rather than stiff black notes on a staff, the lines of sheet music float and dance through the background of the pictures. Organic forms swirl about Mr. Mergler and his pupil – blossoming boughs rise from the keyboard, and ivy and green leaves in the final pictures suggest how Mr. Mergler’s legacy lives on.